Noodles are my most-craved food, especially those of the saucy, sticky, garlicky stir-fry variety. But once temperatures dip below freezing, it’s all about the spaetzle, baby. Swapping these German egg noodles for pasta is such an easy winter kitchen hack that I feel compelled to spread their gospel. You can make spaetzle yourself! My Oma’s recipe (below) calls for just four ingredients: flour, eggs, water, and salt. Few people I know have time or energy to make homemade pasta on a weeknight, but spaetzle takes less than 10 minutes. Spaetzle is wonderfully toothsome. Done properly, it has a chewy-springy texture that’s still absorbent, soaking up all the deep juice, broth or stew that are the best part of winter dishes. Spaetzle can also be crispy! If your dish needs a bit of bite, just pan-fry your spaetzle in butter after boiling. Their edges develop beautifully brown exteriors that pack more Maillard goodness than rice or pasta. They’re super filling. I’m not sure whether it’s the eggs or the fact that spaetzle use a crap ton of flour, but these little lumps of joy stick to my ribs in the best kind of winter way. I’ve had success substituting spaetzle for starch in all kinds of recipes. They’re great for soaking up meaty stews like goulash, obviously, but are also delicious in place of noodles in chicken noodle soup. My mom always added them to ham and split pea soup, which makes the bowl even more substantial. 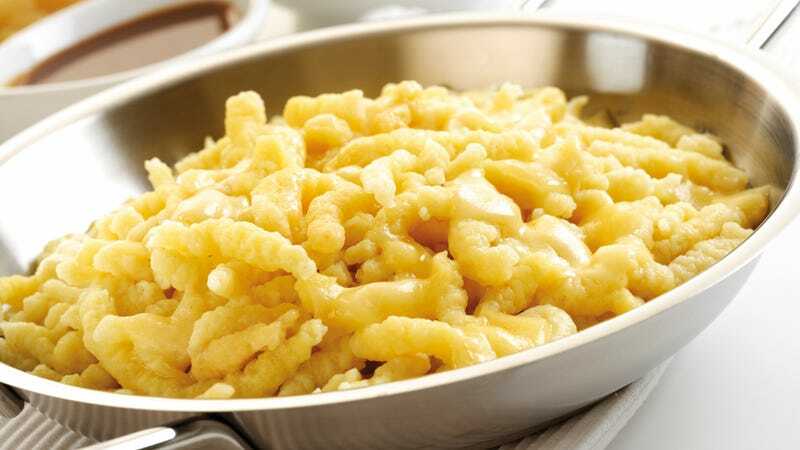 You can even bake them with cheese and caramelized onions for a German take on mac ‘n’ cheese (kaesespaetzle), too. Are you convinced? Read on. ** A note on batch size: The general rule of thumb is one egg per half-cup of flour, so scaling this recipe up is easy. Plan on about one egg per person you’re serving. The recipe below would make enough for four people, but even if you’re cooking for just one or two, make a double batch. It freezes well, and no one is ever mad about spaetzle leftovers. Place the flour in a medium-sized, preferably heavy mixing bowl (the weight of the bowl helps when you’re beating the absolute crap out of the dough). Sprinkle in some salt. Add the eggs. Using a wooden spoon, fold the eggs into the dough. Technique is key here: Don’t stir the dough, but forcefully beat the eggs into the flour with an arc motion. You’re trying to create air bubbles in the dough, which will make the noodles light and fluffy. Add splashes of warm water if the dough looks too dry. As the dough gets springy, allow it to cling to the wooden spoon while you lift it, creating air pockets. You’re doing it right if the dough gets very sticky and shiny. Once the dough is clinging to the sides of the bowl and your spoon, either use a spaetzle press or a colander to press the dough through the holes and into the boiling water. You can also scrape pieces off to make larger-sized dumplings using a paring knife. When the noodles float to the top (this doesn’t take much time at all), remove them with a slotted spoon. Air dry them on a cloth towel. Optionally, you can now heat some butter and herbs in a saute pan and pan-fry the noodles if you’d like them crispy.